The Loyal Edmonton Regiment traces its lineage back to 1908 with the formation of the 101st Regiment (Edmonton Fusiliers). In 1920 the 101st Regiment was renamed The Edmonton Regiment and then in 1943 was renamed again as The Loyal Edmonton Regiment. For a more detailed summary of our history, go to the Our History page. 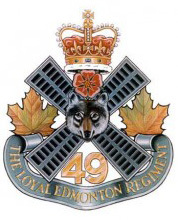 The Loyal Edmonton Regiment is part of Canada’s Army Reserve. The unit is currently tasked to train for augmentation of Canadian Forces (CF) operations and commitments for domestic emergencies within Canada, as well as part of the international community, such as the United Nations (UN) and NATO. We are an infantry unit whose role is to close with and destroy the enemy, day or night, in any terrain and in any weather. While the tactics of employment in battle have changed, the basic mission of the infantry has not, and the Regiment takes great pride in doing its job well. Members of The Loyal Edmonton Regiment are reservists in the Canadian Forces. As part-time citizen soldiers, we work full-time civilian jobs or are enrolled in full-time studies at Secondary Schools, Colleges and Universities while serving Canada on a volunteer basis. Conduct training one evening a week – Wednesday nights, 7- 10 pm (September to May). Conduct Field Training Exercises – Weekends, monthly. Actively participate in community events. Volunteer for summer training and employment at various training centers across Canada. Volunteer to deploy for military taskings within or outside Canada. Members may also undergo specialized training such as airmobile, amphibious, mountain and urban operations and are trained to operate in all environments, including the arctic, mountain, jungle and desert areas. As your career advances so will the challenges facing your leadership ability. You will be constantly learning and acquiring new skills that will aid you in both your military and civilian life. For more on what we do in the infantry click on the following links. Be sure to look at the Part-time Option tab. The Loyal Edmonton Regiment also has an active and excellent band. For detailed information, go to the Regimental Band page on this site.